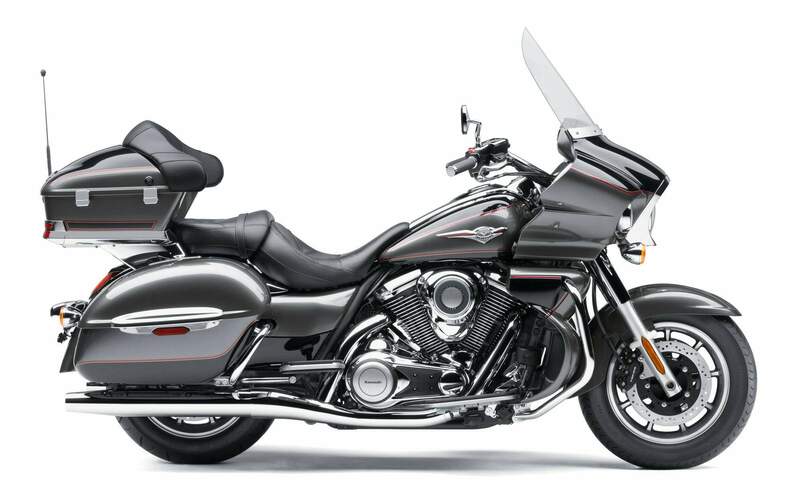 For those who heed the call of the open road, the Vulcan® 1700 Voyager® satisfies that wanderlust – and then some. 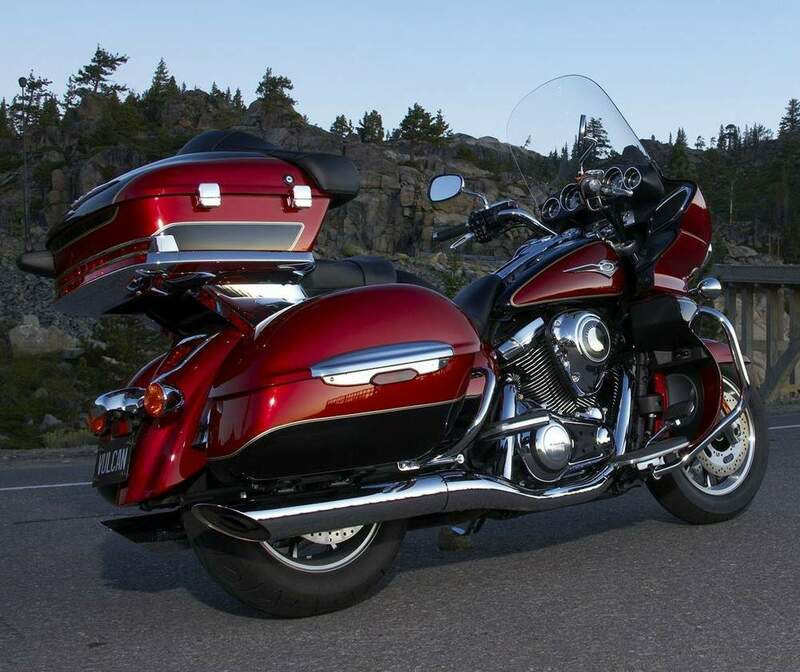 Complete with all the full-dress accouterments necessary to keep riders and passengers comfortable on long journeys, and equipped with a powerful engine that helps eat up the miles, the Voyager delivers a memorable experience in classic style. And with its muscle car-inspired styling, the curvaceous Voyager turns heads whether your destination is across the country or just across town. The Voyager boasts all the stuff you’ll need for adventurous treks: a smooth and torquey 1,700cc V-twin powerplant, large frame-mounted fairing, beautifully integrated luggage that stows a week’s worth of gear, a comfortable saddle, electronic cruise control, high-fidelity sound system, optional K-ACT anti-lock/integrated braking system and the sort of design acumen and dependability Kawasaki is renowned for. All V-twins present engine heat challenges, especially full-dress models with leg shields, since the rear cylinder and exhaust pipe are almost directly under the rider. Kawasaki is the first manufacturer to provide, as standard equipment, an effectively designed air management system to help increase rider comfort at a stop. The primary part of the Kawasaki Air Management System (KAMS) routes radiator heat to the ground, below the engine, while the secondary part of the system draws heat away from the rear cylinder and exhaust pipe and directs it to the ground on the left side of the motorcycle. This system is particularly effective in warm weather while stopped in traffic or for extended periods of low-speed operation, such as during staging for group rides or parades. Though a non-ABS model is available, the 1700 Voyager’s driveline/braking technology is enhanced with the addition of the second-generation Kawasaki Advanced Coactive Braking Technology (K-ACT) system. Available on the ABS-equipped Voyager, K-ACT uses advanced electronics to translate the rider’s braking inputs from both the front lever and rear pedal into smooth, balanced deceleration and maximum stopping performance. Basically, the front lever also activates the rear brake, and the rear pedal also engages the right front caliper: K-ACT ensures all this happens seamlessly and efficiently, and the second-generation system uses the same smaller, lighter ABS unit and faster, higher-spec brake ECU found on the Kawasaki Concours™ 14 ABS motorcycle for even smoother, more precise operation. K-ACT’s coactive function does not engage when braking is applied at speeds below 12 mph, and the ABS function is automatically disengaged at speeds below 4 mph. 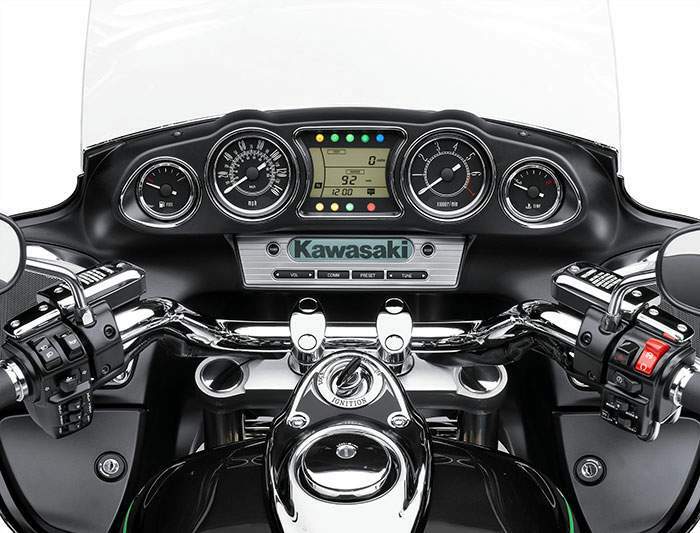 There’s much more on the unique technology front, including Kawasaki’s fully electronic throttle valve system, which works in concert with the Voyager’s Electronic Fuel Injection (EFI) system to enhance engine response without dulling the big Vee’s distinctive throb. The system also helps the ECU deliver ultra-precise air/fuel metering and more accurate idle speed control. The setup utilizes an Accelerator Position Sensor (APS) and Throttle Position Sensor (TPS) that feed data to the ECU, which adjusts the throttle plates to tailor intake airflow accordingly. The system offers natural throttle feel, as APS is activated by a throttle-body pulley connected by cables to the throttle grip. The 1,700cc 52-degree V-twin all of this cool technology was designed to support is a marvel of engineering, and is as functionally capable as they come. Featuring liquid cooling, four-valve cylinder heads and a single overhead cam setup for big-time mid-range power, the engine utilizes a pair of big pistons to pump out a massive quantity of torque over an unbelievably wide rpm range – a key to this engine’s superb flexibility. There’s a boatload of the stuff located throughout the rpm zone where riders will spend the most time – and more than enough from idle all the way to 5,000 rpm, so major-league, arm-straightening thrust is available right now every time you twist the grip. The Voyager’s fuel injection and exhaust systems are tuned to deliver peak torque and horsepower at slightly higher rpm than the Classic models, which is optimal for an open-road tourer. The Voyager’s mufflers have excellent sound quality and a tapered, classic look. Additional touring functionality is provided by the Voyager’s beefy but easy-to-squeeze clutch, which features six damping springs and progressive three-stage engagement for easier shifting under hard acceleration. The Voyager’s innovative technology is matched with essential touring features such as electronic cruise control and a six-speed transmission with overdrive fifth and sixth gears. The cruise control is conveniently operated from the right handlebar and can be activated between 30 and 85 mph in any of the top four gears. Conveniently, the cruise control can be disengaged by pressing the brake lever, clutch lever, rear brake pedal, or by manually rolling off the throttle. Featuring overdrive ratios and a super strong carbon fiber reinforced drive belt, the Voyager’s drivetrain is ideally suited to its role as a relaxed mile-eater. Its tall fifth and sixth gears contribute to relaxed riding and better fuel economy at highway speeds, and its carbon fiber reinforced drive belt has a 40-percent higher tensile strength than the latest Kevlar units, allowing use of a 28mm design that minimizes drivetrain width. 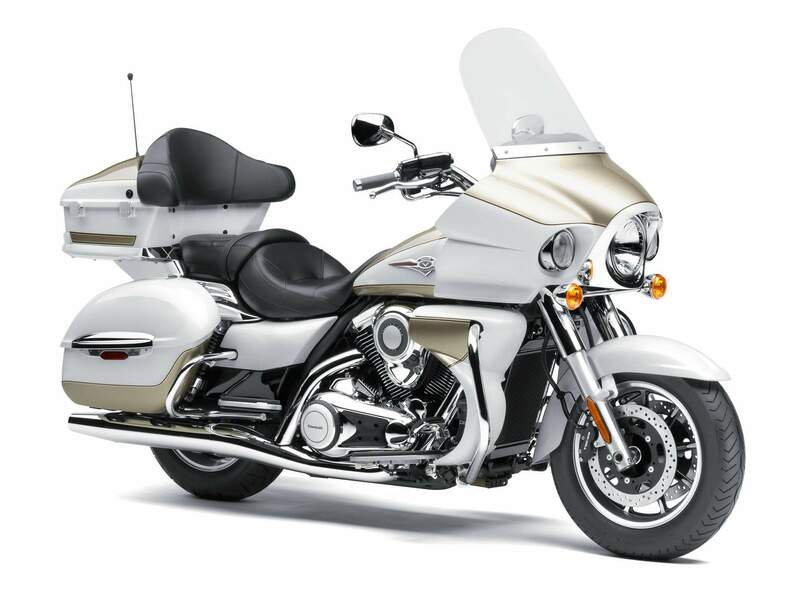 A long-haul tourer needs superior wind and weather protection, and the Voyager packs plenty in the form of its large frame-mounted windshield and fairing, as well as leg shields that incorporate effective venting to keep engine heat off the rider’s legs during slower going. Mounting this beautifully sculpted fairing to the frame transfers any wind buffeting to the bike rather than the handlebar, which reduces rider fatigue on longer trips. A full complement of stylish and integrated luggage is also part of the Voyager package. Sealed, lockable and top-opening side cases with 10 gallons (38L) of volume partner with a color-matched, 13.2-gallon (50L) lockable tail trunk that’s big enough to swallow two large full-face helmets. Besides ample storage, the Voyager also has a pair of lockable glove boxes up front that provide a handy place for storing small items and accessories. Comfortable seating for rider and passenger is a must on a touring bike. The Voyager delivers again with deluxe touring seats sculpted to provide support for all-day touring. Contributing to long-distance passenger security and relaxation are a luxury backrest and floorboards for both the rider and passenger. Built-in instruments and radio controls mounted on the Voyager’s classic automotive-style dash offer exceptional functionality and classic muscle car styling. The image is reinforced by the classic font used on the large round dials of the instrumentation and a radio styled to resemble 8-track players from the 1960s. A multi-function LCD display is mixed in with the retro analog dials in the center of the instrument console. It’s controlled by switches on the right handlebar and features a gear-position indicator, clock, odometer, dual trip meters, remaining range and average fuel consumption. The intercom headset-compatible, 40-watt, twin-speaker audio system features navigation audio prompts, a three-band (FM/AM/WX) radio that is also compatible with iPods, an XM radio tuner, or a CB radio unit. The audio system (and iPod) can be operated by an integrated controller on the left handlebar. In addition to volume, the rider can also adjust the bass, treble and balance levels of the system. The Voyager also features a water-cooled, rare earth magnet alternator that produces an impressive 46.8 amps of electrical output – enough to power add-on navigation systems and other electrical accessories that add to the modern touring experience. The Voyager also features a convenient cigarette lighter-style power port on the dash and two power outlets under the seat – ideal for additional accessories. Kawasaki designers packed the Voyager with advanced technology without dulling its dramatic styling and attractive visual appeal. Like the dashboard, the Voyager’s bodywork continues the ’60s muscle car inspiration with its curved, muscular lines. The meticulous attention to detail and exquisite craftsmanship of the bodywork and engine covers is obvious in contoured shapes that look good from any angle and are as pleasing to the touch as they are to the eye. The Voyager handles like a much lighter machine thanks to optimal chassis design and excellent suspension. Dual air shocks offer 3.1 inches of rear suspension travel and feature settings unique to the Voyager. The shocks feature 4-way rebound damping adjustability to help ensure predictable handling and a comfortable ride. 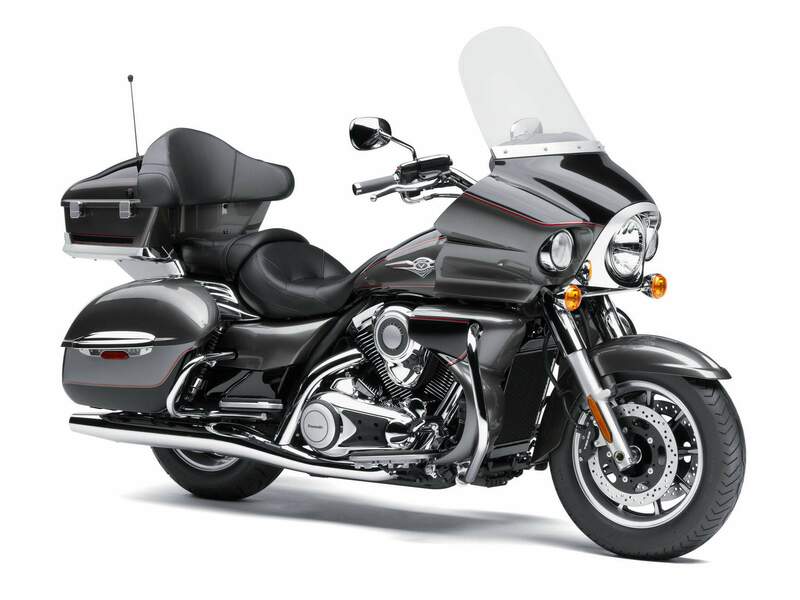 Offering a stylish alternative to other run-of-the-mill V-twin tourers, the Vulcan 1700 Voyager combines Kawasaki reliability with the performance, V-twin feel, comfort and amenities long-distance touring riders demand. * The Manufacturer's Suggested Retail Price does not include freight, pre-delivery inspection or applicable taxes. The final price is at the discretion of the dealer. Prices and Specifications are subject to change without prior notice.